Ask for it in bookstores everywhere and watch for the publication of our second short recipe book: Dog Treats: The BARKtenders Guide to Easy Homemade Pupcakes. You like cocktails and cupcakes, so why not “Dogtails” and “Pupcakes” for your pooch? 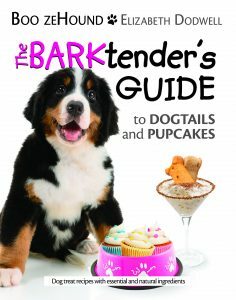 The BARKtender’s Guide recipes are for discerning dogs everywhere. From the most well-heeled hounds to mutts from the other side of the track our books feature tasty tipples such as the Dirty Muttini and Slow Comfortable Sniff, and Pupcakes (doggy cupcakes) like the Fang Q Very Much and Bite Me. These treats are healthy, easy to make and deliciously fun for you and your BFF. The dog-tested delights will have your canine connoisseur drooling for more and, guess what? The ingredients are natural, often organic and sometimes gluten free. So have a Pawty! Invite the pack for a doggone good time. A portion of every sale will give a needy dog a bone and help find him or her a home (ie. donations made to shelters).